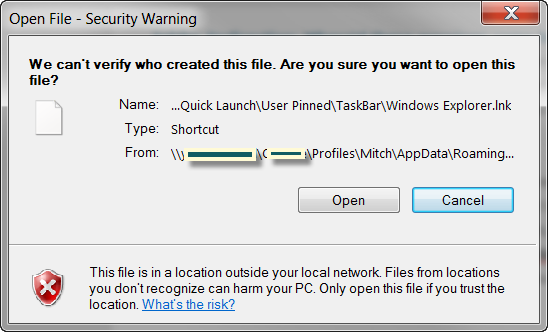 Folder Redirection: Where’d these warnings come from? Congratulations. You have decided to implement a Folder Redirection policy on your domain. There are real advantages to this, not the least of which is that all of your users’ profile folders will get backed up centrally… and that when they change computers their files and settings are just there. You have created a Group Policy Object (GPO) in Active Directory that you have called Folder Redirection, and you have applied it to the Organizational Unit (OU) that your user account is in, and as is so often the case with Desktop Administrators, you have made yourself the guinea pig. From Windows you run the command gpupdate /force, and are informed that in order for the Folder Redirection policy to be applied, you will have to log off and then log on again. You do. It must have worked! Why do you I say that? Because unlike most of the time, when logging on takes a few seconds, it took a full ten minutes this time. As a seasoned Desktop Admin you understand that this is because all of the folders that you set to redirect – Documents, Pictures, Videos, Favorites, Downloads – are being copied to the server before you are actually allowed onto your desktop. However a few minutes later, once you are logged on, you open Windows Explorer, and in the navigation pane you right-click on Documents, and see that the My Documents folder is no longer at c:\Users\Mitch, but at \\Sharename\Mitch. As a seasoned IT Pro you know that security warnings are a way of life, and it wouldn’t bother you if you had to accept this every time… but you know your end users are going to go ape, so you need a solution. No problem. I should mention that while these steps will work for all versions of Windows since Windows Vista, the way you access the screens may be a little different. 1) Open Control Panel. Don’t be alarmed, you are going to get the same security warning when opening the CP. 2) In the Search window type Internet Options. When it comes up, click on it. 3) In the Internet Properties window select the Security tab. 4) On the Security tab click on Local Intranet. Then click on Sites. Note that the Sites button will be greyed out until you select Local Intranet. 6) In the Local Intranet window click the Advanced button. 5) In the Local Intranet (Advanced) window type the location of your folder redirection share into the box marked Add this website to the zone: Uncheck the box marked Require server verification (https://) for all sites in this zone. Click Add. Then click Close. 6) Close the Internet Properties window. Now try opening Windows Explorer again. It should open without the security warning. Okay, so you know how to configure this setting for your individual desktop… but you don’t really want to have to go to every desktop/laptop/tablet in the organization and do this, do you? Of course not, that is what Group Policy is for! We are going to make one change to your Folder Redirection policy. 1) Open Group Policy Management Console. 3) Navigate to: User Configuration – Policies – Administrative Templates – Windows Components – Internet Explorer – Internet Control Panel – Security Page. 4) Right-click on Site to Zone Assignment List. 7) In the Value name cell enter the UNC path of your file share. 8) In the Value cell next to the UNC path you just entered enter the value 1. (Where 1=Intranet/Local Zone, 2=Trusted Sites, 3=Internet/Public Zone, and 4=Restricted Sites). Click OK then click OK in the Site to Zone Assignment List dialogue box. 9) Close Group Policy Management Editor. That should be it… remember you will have to re-run your gpupdate /force on your machine, but even if you don’t it will apply in the next few logoffs, right? **Thanks to Joseph Moody for the list of settings for the Zone Value list!